Jasmine (Cate Blanchett) has lived the life of a high-society woman in New York for years, married to financier Hal (Alec Baldwin). However, he was busted for running some schemes that lost a lot of people all their money. Broke, Jasmine has gone to stay with her sister, Ginger (Sally Hawkins) until she gets back on her feet. Despite her own situation and ruin, she constantly criticises Ginger for her choices in life and in men whilst struggling to maintain a semblance of sanity. I’ve not seen a lot of Woody Allen films, but I think this is a pretty good one. The characters are believable in all their insanity and the emotional discomfort created is quite intense. 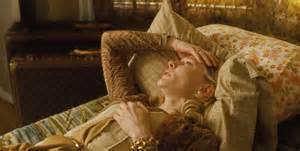 Cate Blanchett is wonderful in the role of Jasmine, seemingly in control much of the time yet totally incompetent in so many ways.